This entry was posted in Card, SCRAPBOOK ADHESIVES BY 3L and tagged blog hop, Card, Clearsnap, photo corners, Pink Paislee, Prima Marketing, Quietfire Design, Ranger Ink. Bookmark the permalink. Very pretty card. Love the subtle color scheme and the 3D flower and sparkly leaves look great. Well done. Beth, I hadn’t realized that was your card over on the hop! It is such a creative use of that sentiment. 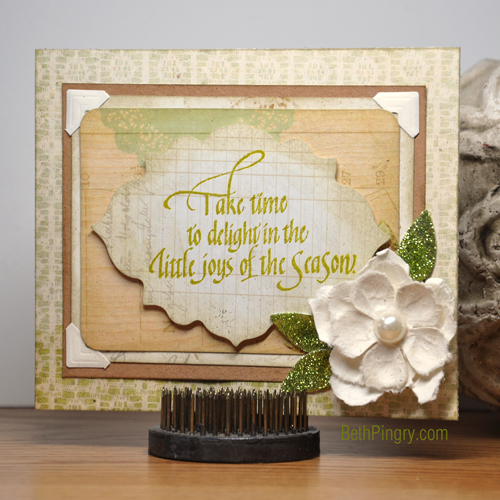 I would never have thought to use it for spring…..but it works so well with your lovely card. Beautiful card! Love the soft, pretty colors!